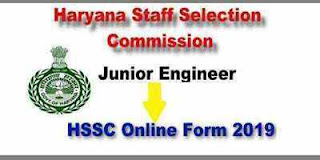 HSSC Recruitment 2019: Haryana Staff Selection Commission (HSSC) has invited online applications from the eligible candidates of Haryana State to fill the posts of Junior Engineer (Electrical). Candidates having prescribed qualification for the HSSC Junior Engineer Recruitment 2019 can apply through the online mode. The online registration process will start from 04 Feb 2019. This is the best job opportunity for those candidates, who are interested to make career in the Govt, Jobs. Candidates must read the notification to check their eligibility, before applying for the HSSC Recruitment 2019. HSSC has published a recruitment notification on its official website to fill the posts of Junior Engineer. Candidates fulfilling all eligibility conditions can apply for the HSSC Jobs 2019 through the online mode. Candidates, who are interested to apply for this job must check the eligibility criteria before going to fill the online form. 1) Candidate should have 3 years Diploma in Electrical/Electrical engineering from any institute recognized by AICTE or by a state board of technical education with minimum 60% marks in case of Gen category candidates and 55% for SC candidates. Bachelor Degree in Electrical/Electrical Engineering or equivalent from a recognized university. 2) Must have passed Hindi/Sanskrit up to Matric. Dear applicant please read the instructions & procedures carefully before filling the application form.